In a strict sense Landesfarben means "colours of the (federal) state" and does not imply any use on flags. Historically however, the colours of the flag are very frequently derived from the arms. Also the flags were usually, at least in the non-maritime states, simple striped flags. The concept of the Landesfarben is, in my humble opinion, a concept of the 19th century, which means, that there are many problems and mistakes. It should be noted that the term Landesfarben is used indiscriminately, even in State publications and legal texts. I have also seen flags consisting of the Landesfarben with coats of arms at the center. I have also seen flags consisting of the Landesfarben with coats-of-arms at the center. These would appear to be either flags of the provincial authorities (most likely) or unauthorized variants. These are only a guess. We have no indication about administrative flags for the German kingdom's Länder. What do we really know about the flags of German states before 1935 (and of Prussian provinces)? Do we know that there were these "State" flags, i.e. service flags with the coat-of-arms? Or do we just assume that? Dreyhaupt 2001 shows the Dienstflaggen (service flags) of East Prussia, Lower Silesia and Upper Silesia. It also says that the coat-of-arms of the Grenzmark Posen-Westpreussen (Posen-West Prussia Frontier Province) as it appears on FOTW was adopted in 1929. From 1925 to 1929 the arms was the West Prussian eagle bearing an inescutcheon with the Posen (i.e. Polish) arms. It does not mention however (as far as a quick reading reveals) a Dienstflagge with either coat-of-arms on the Posen-West Prussia flag. There was a variant flag of West Prussia with [the historical Royal (Polish) Prussia] coat-of-arms. I do not know when this variant was created. It was definitely in use in the 20th century, to 1920, maybe 1939-1945 too. I have made a GIF and here is also a scan. The Landesfarben were granted by the Prussian state ministry to the province on the 9th September 1923 and lasted until 1940, although all the flags of the Länder and provinces were already abolished in 1935. An explanation for this would have been the use of the flag for political propaganda at that time. It should be noted that the combination of the colours of Western Prussia with the one of Posen appeared before the adoption of the coat of arms of the Grenzmark where the inescutcheon on the eagle displayed this combination. Until 1929, the inescutcheon was the coat of arms of Poland. Erwin Günther shows a flag with the proportions 3:5, but Ottfried Neubecker, who is the best reference for coat-of-arms and flags, shows a 2:3 flag. Sources: Günther 1998 and Ottfried Neubecker, Die neuen Wappen der preussischen Provinzen, in Der Deutsche Herold. Zeitschrift für Wappen-, Siegel- und Familienkunde, 60. Jahrgang, Selbstverlag des Vereins "Herold", Berlin, 1929, pp. 5-6. 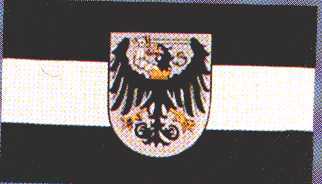 Possible administrative flag with coat of arms, consisting of a silver field with a black Prussian eagle, emerging from the neck is a silver arm with armor grasping a silver sword. In the center a escutcheon of the same field as the flag. There wasn't any service flag for this province. After the [Second World] War, the association in West Germany of people coming from the former province, used the former banner of the Grenzmark Posen-Westpreussen with the coat of arms of this province in the center of the first quartering of the flag (that is one-third from the top). They used also a variant of the flag of the Grenzmark where it was (here) divided in half vertically and in thirds horizontally. These two last flags are exceptions and were privately used. Sources: Günther 1998 and Ottfried Neubecker, Die neuen Wappen der preussischen Provinzen, in Der Deutsche Herold. Zeitschrift für Wappen-, Siegel- und Familienkunde, 60. Jahrgang, Selbstverlag des Vereins "Herold", Berlin, 1929, pp. 5-6. Editor's note: see also modern Brandenburg. Black-white horizontal bicolor. Officially adopted 22 October 1882. Abolished 1935. A possible administrative flag would be like that of East Prussia 1882-1935, but with coat of arms, consisting of a silver field with a black Prussian eagle, at the center. The arms would be without the crown around the neck and the arm and sword, but with the crowned head and the FR monogram on the breast; thus, the arms of Posen with the monogram replacing the escutcheon. (Source for arms: Erlass des preussischen Staatsministeriums vom 28.2.1881). Please note that the qualifications on the all the Prussian administrative flags apply, that is: I am not aware of an State source for any of the flags (as opposed to the Landesfarben, but I have seen (all? most?) of them for sale and in flag shops etc. This variant of a possiable "East Prussia State Flag" (with no crown or "R") is based on a design being widely reproduced and sold today as the East Prussian flag. The coat-of-arms seems a bit large on these modern replica flags, but it is what is being sold.